We intend to describe the skeletal anatomy and phylogeny of one of the earliest maniraptoran dinosaurs of North America. Maniraptoran theropods (including the famous Velociraptor) were the group of dinosaurs that includes the ancestors of birds. The new specimen lived in Wyoming during the Late Jurassic Period (~150 mya). Only three feet long, this new species is one of the smallest dinosaurs from the Morrison; it's considered a missing link between small, meat–eating dinosaurs and modern birds. In 2001, the partial skeleton of a small dinosaur was collected in the Late Jurassic Morrison Formation of east-central Wyoming. The specimen contains more than half of the skeletal elements, including most of the skull. In 2005 we reported on an initial phylogenetic investigation that found the new specimen to be a troodontid, a group of theropods closely allied with birds. If confirmed it would be the only known troodontid from the Morrison Formation, and the second troodontid from the Jurassic Period. The phylogenetic context of the specimen - who it is most closely related to - is paramount to our understanding the specimen. To better understand it we have undertaken a multi-year project to expand our analysis of both the specimen, and of other closely-related dinosaurs. Once we resolve the relationships of the new specimen, it will tell us much about what the ancestors of birds were doing before the avian line branched off. Jurassic maniraptorans are rare, and existing species from Asia so far are small and potentially arboreal. Our new species suggests that the ancestors of birds occupied a larger range of sizes and habitats, which will provide a broader understanding of what the ancestors of birds were doing in the Jurassic. In addition, many isolated remains of indeterminate small theropod dinosaurs from the Morrison are held in numerous collections; the description of this specimen may assist with the future identification of such remains, and help to pinpoint the amount of small-dinosaur diversity in the Morrison Formation. A description of the key anatomical features of the specimen. Resolve the relationships of the new specimen, while improving the data set used to test maniraptoran relationships in general. Incorporate an improved temporal resolution via radiometric dates of detrital zircons (currently in progress). Two samples from near the quarry level are being prepared for LA-ICP-MS, with eventual CA-TIMS analysis planned for the most promising grains. A generous donor has pledged flight miles to facilitate international travel for collaborators to meet and finish the specimen description. The funds currently promised will be used to bring this project to a complete and successful conclusion without further fundraising campaigns. It is precisely this type of science project that excites me!! All the right people working on a truly exciting fossil. The find of such a great fossil which will tell us so much about the individual animal and its story in the evolution of such a cool lineage of critters is a great thing to have happen, but to then bring it to scientific light in a way that the general public can be involved is spectacular! I'm extremely excited to endorse this project and campaign. It is extraordinary that such a wonderful specimen has been found in the Morrison Formation - perhaps the most thoroughly examined geological unit in the world. More importantly, this specimen will re-write the evolutionary history of the maniraptorans - a terrifying group of ferocious predatory dinosaurs. MOST importantly, there is no better, more knowledgeable team to describe the specimen, and to share in the honor of naming it. I have been the Director for the Big Horn Basin Foundation for the past two years. Prior to that, I previously worked for the Wyoming Dinosaur Center as the prep lab manager and the Tate Museum as a paleontological technician. I have been in paleontology on and off for the past twenty years. My most recent achievement is a book I wrote for the Big Horn Basin Foundation called "Wyoming's Dinosaur Discoveries" which educates the reader on where Wyoming Dinosaurs are located around the world. Hey, thanks for checking out my bio! I have been working in palaeontology for some 8+ years and during that time I've been very privileged to travel around the world and work on many fascinating projects from excavating dinosaurs in the American West to discovering new species of extinct marine reptiles in the UK. I work as a freelance palaeontologist but am affiliated with the University of Manchester as an Honorary Visiting Scientist. I'm very passionate about science communication and actively engage with traditional and social media. I've written two books, numerous scientific papers and many popular articles and regularly appear on television, most recently as series advisor and recurring on-screen expert presenter for a TV documentary called Dinosaur Britain (a two-part series based in-part on my book, Dinosaurs of the British Isles). I am also the patron of the UK Amateur Fossil Hunters organisation. 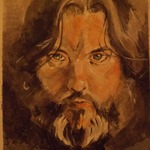 For more, please visit my website: www.deanrlomax.co.uk. 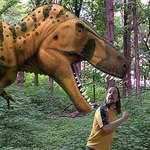 Bill has over 20 years experience in Paleontology. 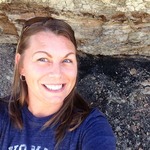 He holds a Masters of Geology Degree from Ft. Hays State University. 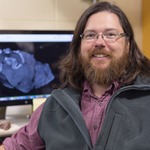 He is currently the prep-lab manager at the Wyoming Dinosaur Center where he is in charge of preparing a selection of material collected locally from various geologic formations. The access to raw material has allowed him the opportunity to teach programs that have resulted in outreach programs at two universities and two nationally recognized science museums. This association has resulted in developing four separate thesis projects on material collected prepared and researched. He has published several papers and submitted abstracts through professional organizations that include regional, national and international meeting of an average of at least two per year. He is also a research associate with the Rochester Institute of Vertebrate Paleontology and the Big Horn Basin Foundation. 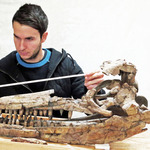 In 1996, Dave began his work in vertebrate paleontology at the Tate Geological Museum where he practiced lab techniques that ranged from fossil vertebrate preparation to molding and casting. 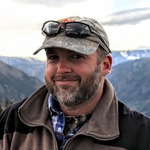 After earning three Bachelors of Science (Biology, Geology, and Zoology) from the University of Wyoming he earned a Master's in Biogeochemistry. 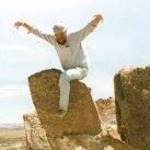 Dave took a hiatus from graduate school to take over the directorship of the Big Horn Basin Foundation where he initiated several key programs, including one that provides high school aged students college credit during a week-long intensive introduction to the science of vertebrate paleontology. That program is still running successfully. Dave finished his Doctorate in Geology from the UW-Madison, where he then accepted a position as a research scientist at the UW Geology Museum. For the last decade Dave has been focused on a multi-disciplinary approach to vertebrate paleontology. His mesozoic publication record includes detailed descriptions of paleosols, paleoenvironmental reconstructions, vertebrate morphology and phylogeny, geochronology, computed tomography, congenital malformations in the fossil record, taphonomy, paleoecological modeling, and terrestrial ichnology. The specimen is cared for by the Big Horn Basin Foundation, a not-for-profit organisation affiliated with the Wyoming Dinosaur Center, Thermopolis, WY, where the specimen is curated.